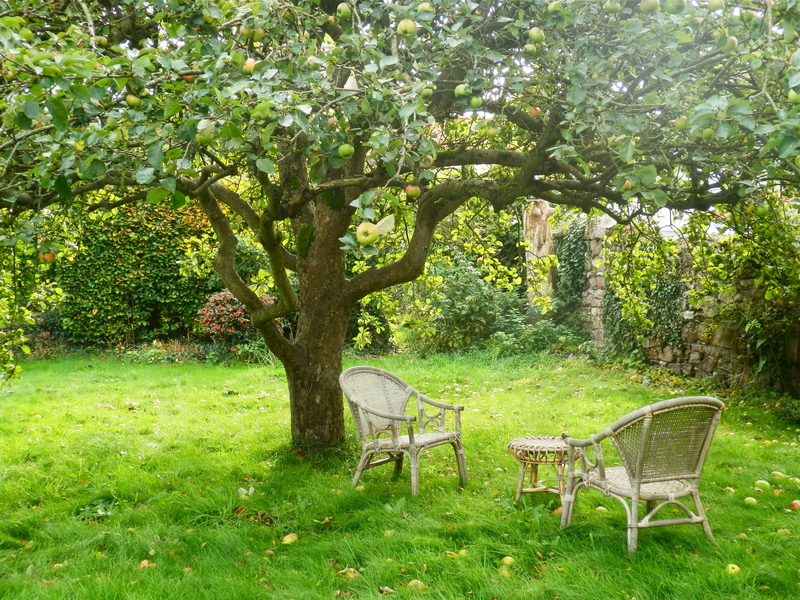 What could be more delightful on a mild autumn day than sitting with a friend under an apple tree? 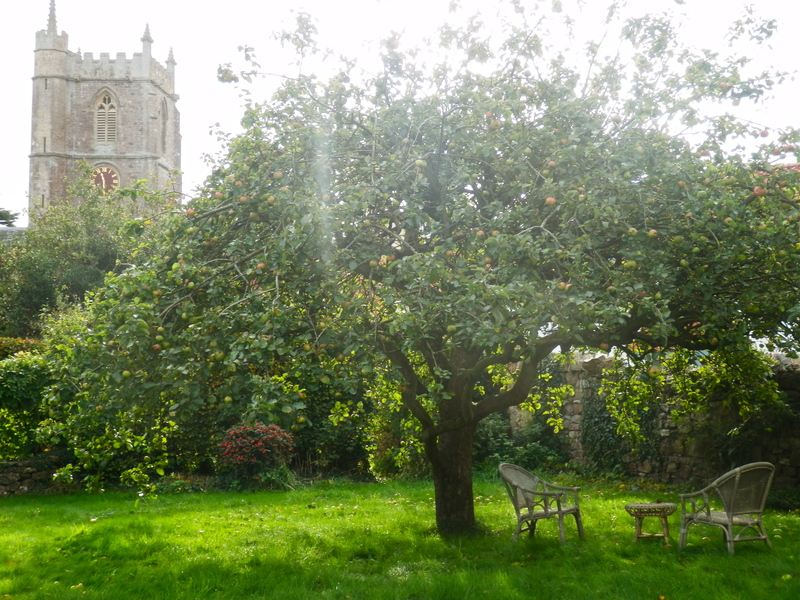 During our visit to Somerset last month, the apples for which the county is famous were perfectly ripe. Pull over an old chair, bring your mug of something hot to warm your hands, and sit idly for a little under an English apple tree. Perhaps you might bring a book to this spot. Persuasion would be perfect: suffused with a gentle autumnal melancholy, and full of scenes of Bath, which is only a few miles from this lovely garden. You might hear the bells strike the hour while you read, from the medieval church beyond the orchard. Oh, but mind that an apple doesn’t fall on your head. The theory of gravity has already been discovered, you know. My mind, I confess, is still full of Jane Austen and Bath. Our visit there inspired me to re-read Persuasion, which in turn, has led on to a more general exploration of the author’s life and work. Not to mention the spin-offs: if you search under Jane Austen on Etsy, for example, the most extraordinary outpouring of creative fandom can be found. More idle pursuits for autumn days! You might enjoy Au pays des pommes. Yes indeed! If anyone ever deserved her happy ending, it must be Anne! Funny you mention Jane Austin, I have been watching Pride and Prejudice while stitching on a fibre art piece this week. I am envious of the apple tree, ours is newly planted and I expect will need years before we have fruit. “Planting hope”, what a great way to describe it! That does look like a delightful spot in which to while away an hour or two! There’s something very English about apple orchards. I like ‘Persuasion’ too, though I must admit that ‘Emma’ is my favourite Austen novel. I first read it at school, when I was about 11 or 12, which is way too young to appreciate it! I love her turns of phrase and her crystal-clear insights into human nature that are just slipped in, almost as asides. I love orchards (except for the inevitable wasps). There is something about them, something numinous, an appeal I don’t fully understand but feel quite strongly. Something to do with druids, perhaps? Or just the ancient association between fruit trees and humans? Each time that I re-read Austen I am struck afresh at her acuity. One finds quotable phrases on every page, insights just slipped in, as you say. Her intuition is timeless: she is so much more than romances in pretty frocks! Oh I loved Persuasion. I re-read it after being in Lyme Regis last year. Am loving your posts – sorry I’m not commenting much but I do appreciate your wonderful use of language and the beautiful photos….especially of Autumn! sigh…. and lovely to see old Bath again. I used to visit often when we had an old family friend living there. Hope to go back next year to see my “new” cousin. Thank you very much for your kind words, Sian. We are all busy and it’s lovely to know that you make time to drop in sometimes. I have never been to Lyme. I first encountered it through ‘The French Lieutenant’s Woman’: it has a rather distinguished literary career! Have you ever read Anne of Green Gables? Or anything by L.M.Montgomery? Because your style of writing, the way you describe planting a tree as “planting hope”, really reminds me of Anne. It’s one of the main reasons I follow your blog and enjoy reading it so much; Anne of Green Gables is my favourite book by far. My spirit soars whenever I read something of the sorts. Oh, thank you so much for your very kind comments. I have not read ‘Anne of Green Gables’ since I was a child. While I don’t remember it well, I do recall that I enjoyed it and its sequels very much at the time. Perhaps it had a subliminal influence! I’m glad you enjoyed it. (Oh, and how I love English cox’s apples too.) This certainly seems an idyllic spot to me, although I can imagine that you are quite right to be wary about sitting under an apple tree at harvest time! Sadly this was probably the last time I will visit this garden, as it and the cottage have been sold by my relative owing to changing circumstances. It is the turn of another family to enjoy the church bells and the apple trees.